Posted on Sat, Jun 8, 2013 : 9:56 a.m.
"Ain't In It For My Health: A Film About Levon Helm"
Screening Sunday afternoon at the Michigan Theater as part of the Cinetopia International Film Festival, "Ain't In It For My Health: A Film About Levon Helm" is director Jacob Hatley's intimate portrait about an inspiring musician. Helm played a sublime, emotion-filled concert at the Michigan on March 19 of last year, dying from cancer exactly a month after the show. How the legendary drummer and vocalist from the Band had the strength to get through the entire night while that sick is a testament to his incredible life spirit, something he carried with him to the very end. A native of North Carolina, Jacob Hatley takes an unconventional approach in this, his first feature film, avoiding most of the usual music documentary cliches to place the viewer right in the frame with Helm during funny, causal and very difficult moments. Recently I had the chance to speak with the laidback director about the making of "Ain't In It For My Health." University of Michigan professor and former Rock and Hall of Fame curator Bruce Conforth will be at the 3 p.m. Sunday screening at the Michigan Theater to talk about this extraordinary documentary. Q: So how did you come to make your movies about Levon Helm? J.H. : Well, I moved out to L.A. and went to film school at USC, and there I made a short film called "China" that made the festival circuit. From there I got to make a few music videos as well. I was mainly doing music videos and short films, then got a job doing a music video with Levon, for the "Poor Old Dirt Farmer" track off his (2007) "Dirt Farmer" album, and that turned into the documentary. The film took three years to make, and just now I'm beginning work on my first narrative feature film. Q: Take us into the approach you took for "Ain't In It For My Health." This isn’t a conventional, dispassionate, A-Z chronological look at Helm's life. Your work is extremely personal. J.H. : What was interesting to me initially, and to us as a crew, is that it was not (about) the music. We didn’t go into this film thinking we would want to see these songs of his filmed. We wanted to focus on him, on who he was. The editor (Tom Vickers) said that if he had never been a musician, if he was a gas station attendant in Arkansas, he would still be worthy of a documentary. We wanted to make a character study, an intimate character study. We weren’t concerned with any historical information and at first we wanted to make a film with no interviews, just scenes between people. Our favorite films, "Gimme Shelter" and "Don’t Look Back," have similar approaches. They let the people in the films speak for themselves. 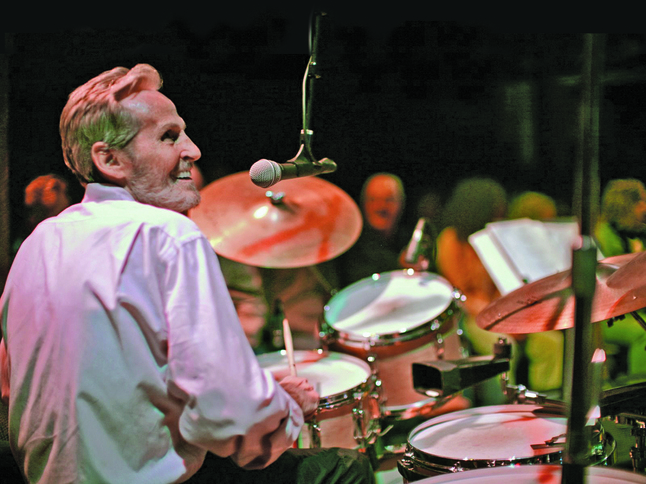 We didn’t want to do an A&E biography - "Here’s Levon Helm and here are the highlights of his career." If you're curious (about that), go to Wikipedia, or go and rent "The Last Waltz." Levon himself said, "I don’t wanna make no biography." Q: You had incredible access to Levon; in fact, you even film him in his doctor’s office when he's having problems with his throat and there are worries he may be having a recurrence of cancer. Was there any time he said no to your film crew? J.H. : Oddly enough, that was the first thing we shot. When we did the music video together I was trying to put the bug in his ear and tell him there was a lot more to shoot and that we should try and do something more in depth. I went back to California and edited the music video, then he called me and said, "Jacob, would you like to come to the doctor (with me) next week?" I think he wanted people to know; he was not guarded. And he never told us to turn the camera off. He was too much of a hospitable, southern gentleman. Q: Did Levon see the finished film before he died? J.H. : He basically saw the (finished) film. We made a few small changes (afterward), but yes, he did. He said, Jacob, "I think you're about 96 percent there." I don’t know what the four percent we screwed up was! Q: What thoughts do you hope people will have about Levon after seeing your film? J.H. : Just what it was like to be at the table with him. Just what it was like on a Sunday afternoon to hang out with a guy with his spirit, someone who's come from an America that doesn’t really exist anymore; a storyteller. I just think ideally he would have a sense of what it was like to hang out with him in a very casual way. Q: What can you tell us about the new film you're working on now? For ticket information, see the Cinetopia website.